Labradoodle dogs are very friendly and love human company. This dog can bring a smile to anyone’s face regardless of how they may be feeling. Thus, a Labradoodle can be very therapeutic for those who are sick, and can be trained as a therapy dog. A therapy dog is a canine that helps people who are lonely or sick by visiting them in hospitals, nursing homes, mental health facilities, prisons and other environments. Labradoodles are the perfect candidates for this line of work, as both the Standard Poodle and Labrador Retriever have been used for many years to help humans. However, despite the fact that Labradoodle dogs are by nature gentle, loving creatures, they do require training in order to be used for therapy. A therapy dog must be well behaved. This means they can’t run around, jump up on people, bark or lick others without permission. In addition, they must be willing to be pet frequently, need to be patient, and act extremely calm around those who may be mentally disturbed or unstable, as well as children who may attempt to tease or grab the dog. A dog can not be high-energy or overly friendly as it may cause unintentional injury or stress to patients. What are the benefits a Labradoodle can provide as a therapy dog? Overall improvement of happiness, affection and wellbeing. Provides friendship to children, those suffering from depression, the elderly, victims of abuse, etc. In addition, patients look forward to seeing and socializing with Labradoodle dogs used for therapy. It positively changes their routine and brightens up their day. What do I need to know about therapy dogs? 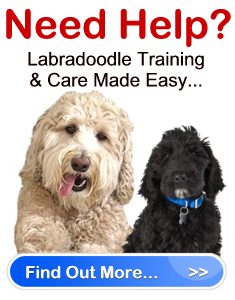 If you would like to have your Labradoodle become a therapy dog, he/she will need to be certified. Your dog will need to undergo and successfully complete appropriate testing. To learn more about what is involved and what you need to be aware of, visit Therapy Dogs International Inc. at tdi-dog.org. Aside from your dog needing to meet certain standards, don’t forget that you are part of therapy as well. You need to be with your Labradoodle while he/she is on the job. This means you not only need to know how to properly interact with your Labradoodle, but you also need to know how to interact with certain types of patients. Therefore, it is important you find out which patients you are comfortable with, and which ones you are not. For instance, although you may be comfortable with the elderly, you may have a problem socializing with those who are mentally unstable. Labradoodle dogs used for therapy require certain types of equipment. For instance, you will want to make sure that your dog has a washable collar and lead. Remember, hospitals and many other public facilities are riddled with germs. You need to protect the wellbeing of both you and your dog. Finally, make sure your dog is well groomed and healthy. Your dog should be free of any parasites or illnesses. His coat, breath and ears should not have a foul odor. If your dog is unwell, you need to reschedule visits until your dog is in tip-top shape. Labradoodle dogs can make the world a brighter and happier place for more people than just their owners. Therefore, if you are interested, find out more about therapy dogs to see if this is an ideal choice for you and your dog.